Some of you are already existing users of the Microsoft Dynamics Community, others should definitely sign up to this site. Hopefully this article will convince you to do so! I recently exchanged a number of emails with Eric Parsons, Senior Technical Product Manager within the Microsoft Dynamics Community Team and we both concluded that we need promote this brilliant portal wider and encourage more people to sign up. The timing was great as last week the team uploaded a new and much better version. Here is an interview with Eric about the benefits of joining the Microsoft Dynamics Community and the recent improvements. Eric, tell us more about your role at Microsoft and please introduce the team? Hi Elena, I want to start by thanking you for taking the time to provide feedback on the Microsoft Dynamics Community and for this follow-up article. One of the things that I most appreciate is having the ability to have direct conversations with the community members using our site. As a Senior Technical Product Manager in Microsoft Dynamics, my main responsibility is to manage all aspects of the Microsoft Dynamics Community, including: community management, support, engineering, testing, and user experience. I have a team of project managers, developers, designers, and community managers (who manage much of the day-to-day tasks within the community). 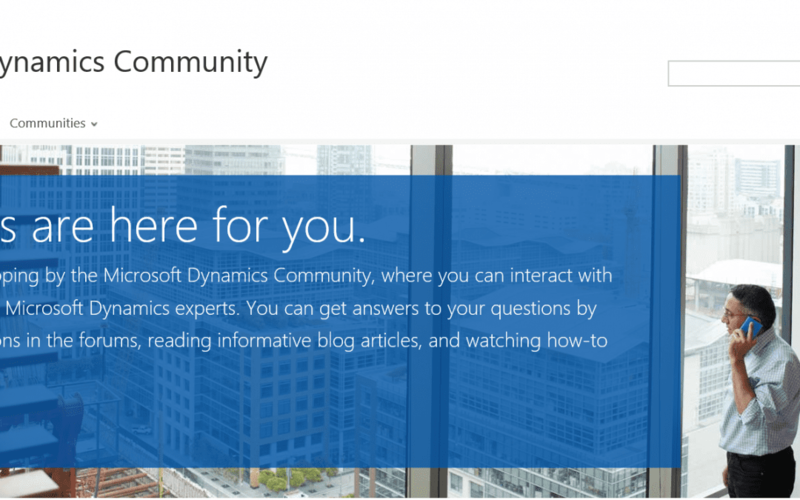 Who should be using the Microsoft Dynamics Community and why? The Microsoft Dynamics Community is a great asset for a variety of people looking to solve a problem or understand how to complete a specific process. Customers on a service plan: If your company has an active service plan for your Microsoft Dynamics solution, you’ll have access to downloads, detailed documentation, and e-learning courses within CustomerSource. When you search within CustomerSource, you’ll also see search results for the Microsoft Dynamics Community, making it your one-stop-shop. If you haven’t found what you’re looking for, you can link directly from the CustomerSource search results page to the Microsoft Dynamics Community forums, allowing you to ask for help. Customers not on a service plan: If your company doesn’t have a service plan, then the Microsoft Dynamics Community should be the first place you look for a solution. You can find answers to your questions by searching blog articles or previously-answered forum questions. If you can’t find an existing answer, you can submit a new question to the forums by signing up (all it takes is a Microsoft Account email address). The forums are monitored by moderators, MVPs, and Microsoft support engineers. If you need an immediate response to an urgent issue, it’s suggested that you consider logging a support incident – instructions can be found via the Support navigation item in your product community. So is it open to everyone: end-users, partners & freelancers? What are the benefits to them? IT Professionals and Developers: You’ll find detailed technical articles in both the blogs and forums and most of the moderators and MVPs are highly technical, and thus well-suited to answer your questions. End Users: You’ll also find a lot of valuable information in the community, starting with great blog articles from Microsoft describing new features and functionality, as well as how-to videos. If you’re having trouble with some process, you can also submit a question to the forums and expect an answer from other end users or our knowledgeable moderators and MVPs. Partners: In addition to the product communities, there is a partner community where partners can get help on sales and marketing questions, as well as licensing and operations questions. What are the advantages of using the community versus forums on LinkedIn, for example? There are a number of other useful forums and groups that focus on Microsoft Dynamics, but the Microsoft Dynamics Community is the single largest site with the most members and the largest group of moderators and MVPs to answer questions. It is also the only site that Microsoft support engineers help answer questions. In addition, there are almost 500 blogs syndicated in the Microsoft Dynamics Community, from both Microsoft as well as knowledgeable customers and partners. In order to post new forum questions, reply to forum questions, or comment on blog articles, you’ll need to sign up to the site. All you need is a Microsoft Account (formerly known as a Windows Live ID) – if you already have an Outlook.com account, a Hotmail account, a Messenger account, or an Xbox account, you can sign in with that account name and password. For more info, you can read our Help Wiki page on how to join and sign in. One of the other benefits of signing up is that you can subscribe to specific keywords or tags in the community, allowing you to stay up-to-date on information that’s important to you. How can people promote their blog posts through the community and what is the process of getting approved? If you have a blog about a Microsoft Dynamics product, you can request it to be syndicated by following these steps. The new Microsoft Dynamics Communitysite looks great. What would you say are the main enhancements? Redesigned Forums – We’ve made it much easier to find answers to your questions (or questions that you can answer) by adding product version and category tags. When posting new questions you’ll be able to select your product version and a category that describes the area of the product you have a question on. When browsing the forums, you’ll be able to filter on those version and category tags, making it easier to find an answer to a question (or find a question you can answer). Mobile-Friendly User Interface – The user interface has been completely redesigned to be “responsive” and the layout changes based on your screen size, allowing it to be optimized for desktops, tablets, and phones. This is not a separate mobile-optimized site, so you’ll have the full functionality of the site available to you, regardless of the device you’re using. Upgraded Badges and Leaderboards – A lot of new capabilities have been added to badges and leaderboards. New monthly leaderboards will be available for overall points, forum activity, and blog activity. This will make it easier for new members to compete against established members. When you make it into a monthly leaderboard, you’ll be awarded a badge (so you can keep track of how many times you make it in) and a corresponding “toast” and email notification. Lifetime leaderboards will be available for overall points, forum activity, and blog activity. This will allow established members to continue competing. These leaderboards also span all product communities. Badges will also be awarded much quicker (many cases in near-real time) and a new dashboard menu available via the top navigation, providing you with quick access to important badges and your current placement in leaderboards. We’ve added many other features as well — read all the details in our Release Notes. Fantastic, thank you, Eric, and good luck with the new version of the Microsoft Dynamics Community! Now you have no excuse – do sign up https://community.dynamics.com or , if you are already a user, do login to check the new and improved features.